Travelling with bicycles can be a wonderful thing. When they are in bags, have to get to an airport, on a plane, to a hotel, to another hotel and onto a truck it's less wonderful. 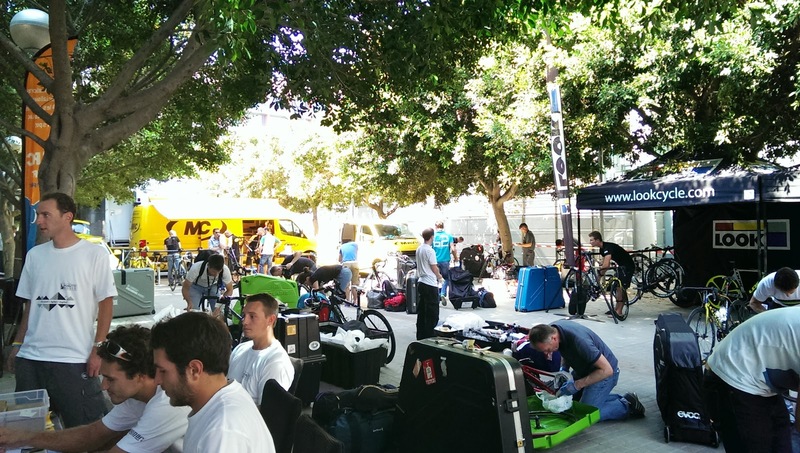 The Haute Route Pyrenees started in Barcelona. We started in Newbury, England. Thankfully our flight wasn't too early so I was picked up by Darren and Becky at 6.45am. Part one of our logistics relied on two full bike bags, two big luggage bags, two small rucksacks and three people all fitting into one Audi A6 estate. Astonishingly we pulled this trick off with relative ease and we were soon on the road. Check-in went well, the other members of our party all turned up and we even managed to meet a few more HR riders in the departure lounge. Arriving at strange airports, in strange countries, with six people, six bikes, six big luggage bags and six small rucksacks could have been hell. No taxis, chaotic buses, language issues, stampeding rhinos. None of these happened as we'd actually planned ahead, and booked two giant taxi vans to take us into town. 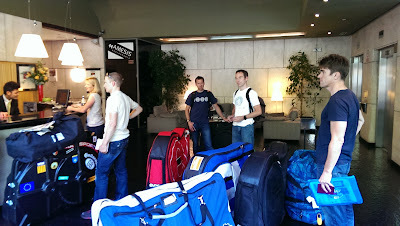 We picked up our bags/bikes/rucksacks, sauntered into arrivals to be met by our drivers. They organised us, stuffed all the bags in one van and all the people in the other and whisked us to the delightful Husa Illa. We did fill reception though. 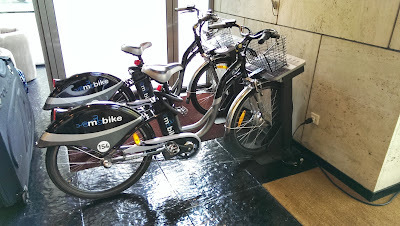 And we noticed that we could have cut down on our luggage lugging by using the hotel bikes. 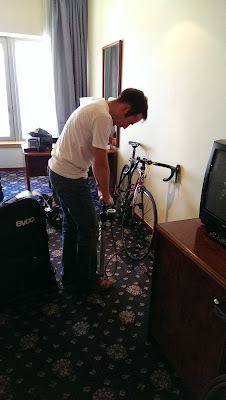 The rooms were even big enough for bike assembly. The next day we had more of a challenge. We were the other side of town to the event registration and village - about 7km. We had a few things to do. 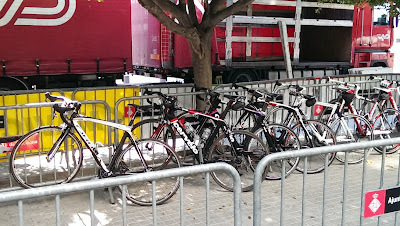 Get the assembled, working bikes into the bike part of the event village, where they'd be safety checked before being trucked to the start of the first stage. Get empty bike bags to the event village, where they'd be taken away to be returned at the end of the race. Get empty luggage to the event village, stuffed into the bike bags. Get us to the event village. Get back to our hotel with official luggage, day bags and freebies, and pack our stuff into the official luggage. The movement of us, bikes and empty luggage to the event village was like a version of the chicken/fox/farmer problem. We wanted to use as few taxis as possible and we didn't want to have to arrange any big vans. After some thinking we came up with a plan. Send Darren and I, riding our bikes, to the event village. Get Phill and Jon to book a single taxi, and load all the empty bags onto it... with no people. Give the taxi driver clear instructions as to the destination, and make sure he isn't paid until he gets there. Phill and Jon then ride their bikes to the event village. Darren and I meet the taxi driver and unload the bags, before paying him. Genius huh? It worked like a charm, with everything ending up at the right location and only one taxi needed! Bike bags and empty luggage were handed in. 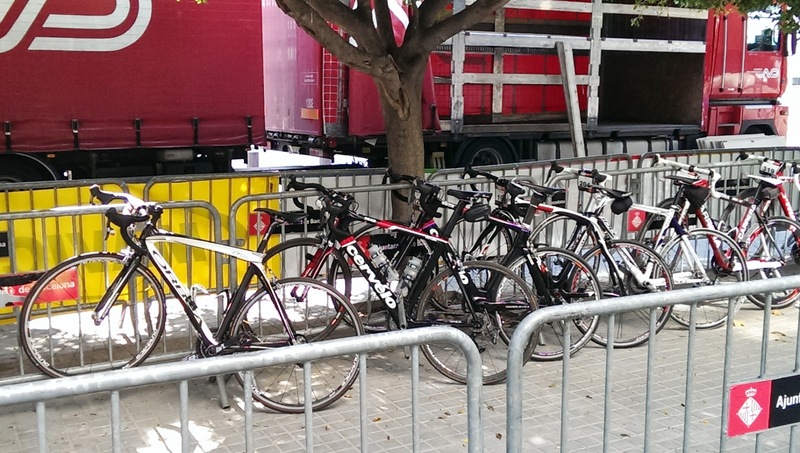 Bikes were checked and racked for loading onto the Norbert Dentressangle truck. And after registration we went for the first of several carb-loading beers. The whole process was exhausting. 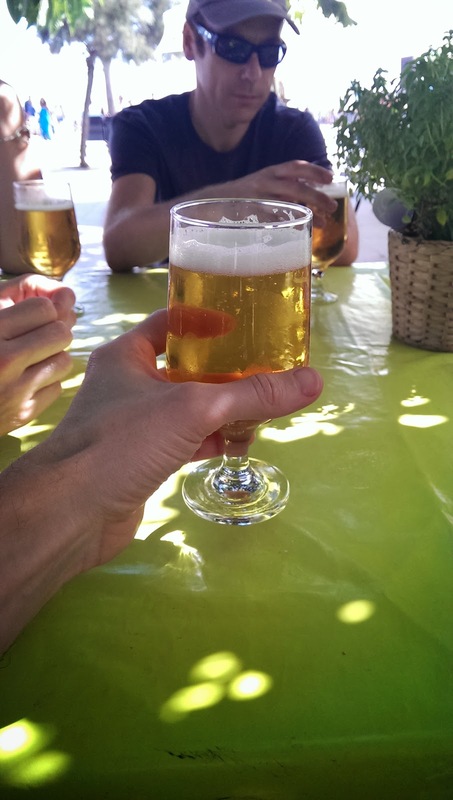 At least we could spend the next day relaxing, riding bikes up mountains for a few hours.